Jim West observed it is, once again, anniversary of the birth of Adolf Schlatter today (of course he did). Amid all the expected and unexpected blog activity at Wenatchee the Hatchet the commentary Schlatter wrote on Romans is still being very slowly digested. 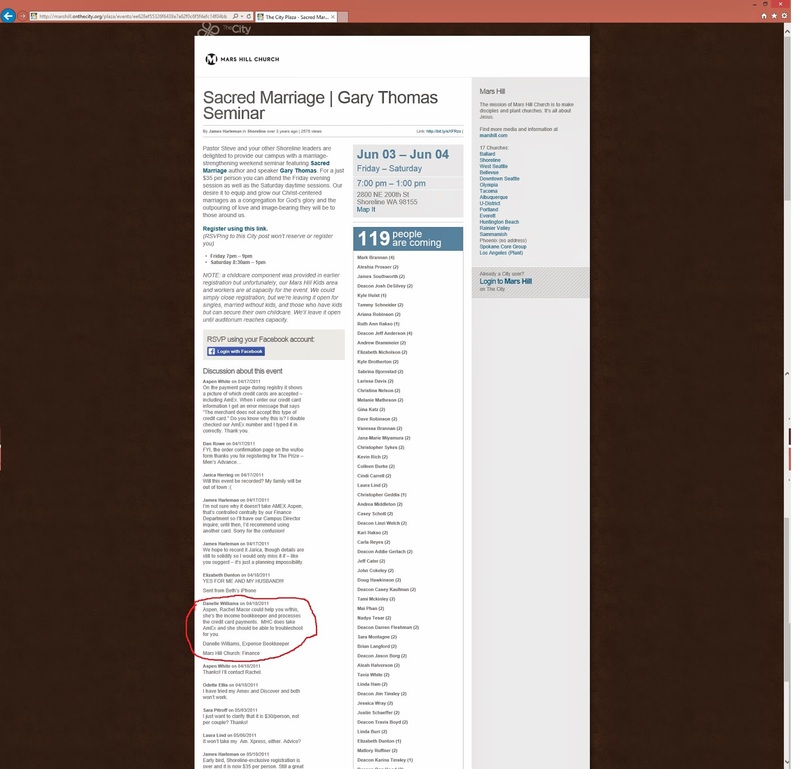 a question about Article 12, section 12.1 of the Mars Hill Church amended bylaws from 11-08-2011 does Mark Driscoll even have an employment agreement with mars Hill Church? Okay, so here's a question. That highlighted section looks interesting. It says that if the board of overseers determines that if a charge or accusation against the primary preaching and teaching pastor of Mars Hill Church turns out to be true then a rebuke will be made or, if warranted, the Board of Overseers will removed said pastor as a member of the board of elders and his employment with the Church shall be terminated for cause UNDER THE TERMS AND CONDITIONS SET FORTH IN ANY EMPLOYMENT AGREEMENTED ENTERED INTO BETWEEN THE PRIMARY PREACHING AND TEACHING PASTOR for the Church and the Church. That is a potentially a very big "if". Driscoll can be thought of as basically self-employed. It is evident by now that not only is he not planning to quit but nobody can fire him. In spite of the evidence of plagiarism, in spite of the admission that Result Source was hired, in spite of the admission that a lot of firings happened and that gag orders were used, in spite of all those things there has apparently not been a single thing that has come to light in the last two or three years that either Mark Driscoll or the executive elders or the Board of Advisors and Accountability considered problematic enough to raise any concerns. Nevertheless "if" there were such charges and such evidence, even what the Board of Overseers could do appears to be entirely contingent on the terms and conditions set forth in any employment agreement entered into between Mark Driscoll as primary preaching and teaching pastor for Mars Hill Church and ... Mars Hill Church. Let's revisit that for a bit. Filing date was back in 1995. So he's had nearly nineteen years since the filing date to have some second thoughts. Even the technical language of Section 12.1 is predicated on the conditional option of removing Mark Driscoll from employment for cause under the terms and conditions set forth in any employment agreement entered into between Mark Driscoll and Mars Hill Church that we cannot be sure even exists. Does such an employment agreement exist? Then let Justin Dean publish it somewhere for the world to see. If there isn't a formal employment agreement between Mars Hill Church and Mark Driscoll the conditional wording in the by-laws of section 12.1 might as well be about the proper way to marinade the meat of a unicorn. Mark Driscoll January 22, 2006 "And if you forget this, this'll be archived". For those who may still be at Mars Hill, it may go without saying the blog Wenatchee The Hatchet would be on the "don't read negative stuff on the internet" list. Given the lengths to which Wenatchee The Hatchet has gone to quote primary sources, particularly Mark Driscoll, it may be worth pointing out that Mark Driscoll in 2006 made a point of saying his preaching and teaching would get archived for future reference so that if, God forbid, he ever went off the rails, his earlier warnings and teachings could be cited as a reference and a precedent to not follow him later. And if at any time in the history of this church the elders discipline me, do not be loyal to me. Be loyal to them; be loyal to Jesus. And if at any point – God forbid – I should say or do something that would disqualify me from being your pastor – and I have no intentions of, and I do live a life above reproach. And I’m not a sinless man, but I do love Jesus and I do love my family and I do love you. And if by – I just shudder to say this, but if I should ever say or do anything that the elders would need to fire me, do not be loyal to me. Be loyal to Jesus; be loyal to your elders. Be loyal to the pastors in your church. Trust them. Follow them. And if you forget, this’ll be archived. [emphasis added] Pull it down and listen to it again, and say, “Mark, you told us to ignore you and follow the leaders in the church and Jesus.” Do that – because at the end of the day, you’re not baptized in my name. You’re not ultimately loyal to me. You are not ultimately devoted to me. My job is to point you to Jesus. He was crucified for your sins. He forgives your sins. He is your God and Savior. He’s the one when you are buried in baptism and raised in newness of life that you are celebrating and honoring – that the focus and heart and the devotion and commitment and the passion in the church must be for Jesus; no one else; no one else. That sure is helpful, knowing that it's archived. So where might one go to download the sermon to give it a listen? Any sign of 1 Corinthians? 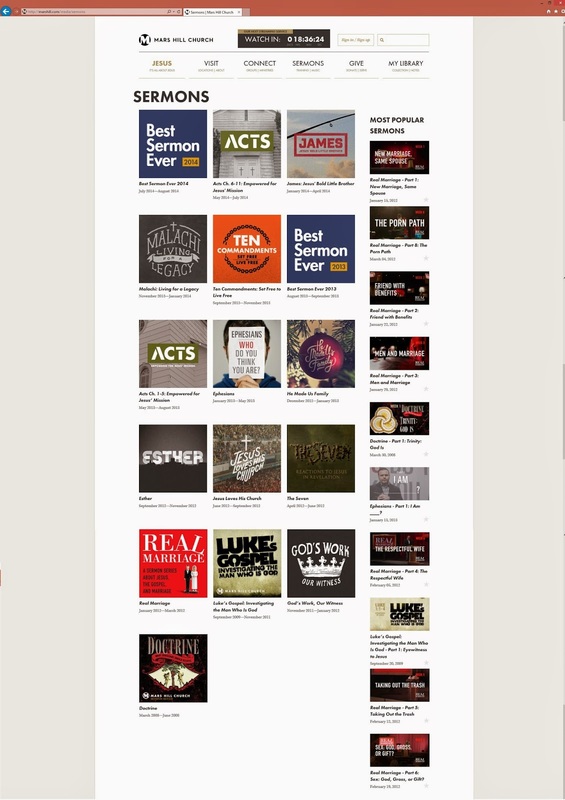 Here's a composite screen cap of what their media library for sermons looked like earlier today in case it ever changes again. So where is the 1st Corinthians sermon media archive these days? How can people recall that Driscoll preached from the pulpit in 2006 that if he ever went off the rails to not follow his lead and that Mars Hill would archive the sermon for posterity if it's not even available to the public anymore? Since Driscoll 2006 seemed to be saying that an archived sermon and sermon archives were intended by 2006-era Driscoll as a testament against him if he ever one day did go off the rails why prevent anyone from being able to listen to that sermon for themselves? To be sure there is a history of someone clipping woodchipper anecdotes from Driscoll teaching content and even of a sermon transcript changing language used by Driscoll from the pulpit that was preserved in audio but in theory if the old sermon audio files were made available and the full transcripts anyone could read for themselves what was said. They can't really do that so easily right now, not without some help. Try these. They're clearly not the Mars Hill media library but Mars Hill spent so many years spreading the message far and wide Mulder would remind us the truth is out there. Mars Hill bylaws on select male deacons receiving licensure for sacerdotal functions by the executive elder team, just males? For those familiar with the Reformed world it might easily spring to mind that there are a few churches out there that do not permit women to be deacons. There are some that do, of course, but what is of note here with respect to the Mars Hill by-laws is that while Mars Hill has a history of having women serving as deacons the newer by-laws feature material Wenatchee The Hatchet has never noticed in earlier copies of by-laws. The thing is this, that some male deacons may be licensed by the executive elder team to perform sacerdotal functions ... but not the women. Why not? Would the capacity to perform sacerdotal functions by those on paid staff differ in terms of tax benefits, for instance? Commentary so far on Mars Hill by-laws past and present has tended to focus chiefly on enumerated powers and protocols for discipline of members or elders for obvious and understandable reasons. But this section from Article 10 introduces a bit of relatively recent Mars Hill governance that may not have been discussed at all. Licensure to Perform Sacerdotal Functions: Certain male deacons who meet additional requirements may be determined by the executive elder team may be licensed to perform sacerdotal functions by the executive elder team, the specifics of such licensure to be determined on a case by case basis. Licensure may confer the authority to administer all ordinances of the Church and qualify the deacon to be a minister of the gospel for purposes of secular law. If any Mars Hill deacons past or, if exceptionally bold, present of any gender want to chime in on this? Given that Mars Hill has a history of stating it is complementarian but that men and women can serve equally as deacons would the extension of licensure apply only to select male deacons because sacerdotal functions would be considered normally restricted to elders in terms of formal employed clergy? Something that Paul Tripp's recently announced resignation from the Mars Hill Board of Advisors and Accountability highlights is his statement that he did not believe the BoAA could do what it was designed to do. It's because of this love that I accepted the position on Mars Hill Church's BoAA. But it became clear to me that a distant, external accountability board can never work well because it isn't a firsthand witness to the ongoing life and ministry of the church. Such a board at best can provide financial accountability, but it will find it very difficult to provide the kind of hands-on spiritual direction and protection that every Christian pastor needs. Unwittingly what happens is that the external accountability board becomes an inadequate replacement for a biblically functioning internal elder board that is the way God designed his church to be lead and pastors to be guided and protected. To get some sense of what Tripp was referring to, we might have to go consult the by-laws of Mars Hill Church. Fortunately, Warren Throckmorton has published those. First of all, noting that as civil membership in the corporation known as Mars Hill Church is concerned, since 2012 at least (with the amended by-laws published by Throckmorton) only elders are members of Mars Hill Church. All other members should be considered more in terms of a spiritual status that has no bearing on voting rights and the like. It is also worth noting that eldership is established at the discretion of the executive elders. The executive elders have absolute and sole discretion regarding the removal of any man from eldership at Mars Hill (Article 5, section 5.7). So we're looking at a Mars Hill where all the members of Mars Hill look to be the elders and the elders remain elders at the discretion of the executive elder board. This could be construed as the members being at will members given the decisions of the executive elders. This alone might suggest Tripp has had some reason to believe that an external board would not be able to do the work an internal board could do ... and that would be assuming that an internal board would even be able to wield any countervailing influence on the executive elders at all if the executive elder board reserves to itself sole and absolute discretion about the removal of elders as civil members of Mars Hill Church. Now for Article 12 of those bylaws, which outline the Board of Overseers and its role in assessing any formal charge and/or accusation made against the primary preaching and teaching pastor for the Church (that is, Mars Hill). Section 12.2. Composition. The Board of Overseers shall consist of five (5) members; one (1) non-paid elder serving on the board of elders, one (1) member of the executive elder team (who is not the primary preaching and teaching pastor) and three (3) non-Church members selected by the primary preaching and teaching pastor for the Church and approved by the board of elders. Each member of the board of overseers must agree with the Church doctrinal statement and must have an impeccable reputation for honesty, character, and judgment. Except as otherwise provided in any employment agreement entered into between the primary preaching and teaching pastor for the Church and the Church, the board of overseers shall be responsible for establishing its procedure for conducting the investigation and rendering a decision. Last year, before it was scrubbed away, the Mars Hill Church Governance page included the following. Keep in mind that none of this may even apply any longer. Nevertheless, since it was available for about half of 2012, it can be considered as a hypothetical from last year. Clearly MacDonald just left the BoAA and Darrin Patrick seems to have gone from such a group as the Board of Advisors and Accountability or the Board of Overseers for a while. The old line up makes sense of what the by-laws require. The newer line-up has some open-ended questions aobut which elder on the BoAA is an non-paid elder at Mars Hill, for instance. At this point it remains to be seen what formal charges have ever been made against Mark Driscoll. Sort of ... it seems. To compare what was stated by Mars Hill in earlier 2012 compared to 2013 go here. Now as reported by Warren Throckmorton on March 26, 2014 Michael Van Skaik issued a letter explaining that formal charges had been made in the past. Precisely what was in the more than 100 letters that were sent out never got an explanation. Wenatchee The Hatchet was given a post-employment follow-up survey that invited feedback about positive and negative experiences and that got discussed in a blog post over here. According to Van Skaik, after a thorough review the charges were found to be non-disqualifying. Now that Kraft's formal charges have been made available it's actually not at all difficult to see why the Board of Advisors and Accountability would consider the charges to be non-disqualifying because no evidence for any of the charges, such as they were, was ever provided by Kraft. Now if Kraft had gone so far as to say there was an ethical objection to be made about the use of Result Source that might have been something, but Kraft wasn't that specific. It's not that the concerns were not (or are not) serious, as made by Kraft, as that the concerns were not really worded in a way that the Board of Advisors and Accountability could have found anything all that specific to assess--at the very least, had Kraft anchored the formal charges to something specific more could have been, in theory assessed. Then again, readers may no doubt already be ready to comment that gag orders might preclude anyone from adding more details to flesh out Kraft's formal charges. Point noted. Van Skaik's explanation quoted above withstanding is there any indication Driscoll has reached out to Petry or Meyer? Not on vacation, of course, but at other times? If Mars Hill could clarify who the non-paid Mars Hill elder who is on the BoAA these days actually is that would be helpful. Without doubt Justin Dean could clear that one up but if Tripp in his resignation has stated he does not believe that the BoAA (which appears to be called the Board of Overseers in the amended by-laws) isn't capable of doing the job it is formally supposed to do then there may be some room for debate as to whether it matters if there is currently a non-paid Mars Hill elder on the BoAA. Considering that of the members of the BoAA Mark Driscoll, Dave Bruskas, Sutton Turner and the lately former BoAA member James MacDonald were crashing Strange Fire while Driscoll was sharing on social media how security confiscated his books, Tripp may have had some reason to doubt that the BoAA was capable of doing the job set out for it. One of the things that has not yet been addressed is whether formal charges would be accepted by Mars Hill's BoAA from only inside of Mars Hill or outside. As there are reports of formal charges being formulated by a former member (and at this point does any regular reader of this blog even need to ask who?) it remains to be seen whether the Mars Hill BoAA would take any formal charges made by former members or outsiders seriously to begin with. It's possible, but it is a matter that could be clarified by the BoAA, if they wish, at a suitable time. Meanwhile, Tripp seems to have publicly expressed a vote of no-confidence in the BoAA and Acts 29 seems to have said they leaned on the BoAA to no avail while two of five members of the BoAA claim A29 hadn't really contacted them (the two) or Driscoll. It remains to be seen what may happen next. The Resurgence Conference has always been born out of our love of Jesus and the church, and the desire to support efforts to grow leaders to grow churches. Unfortunately, we have decided to cancel this year’s conference due to unforeseen changes to our speaker line-up and other challenges we believe would make it difficult to provide the quality of conference people have come to expect from Resurgence. Anyone who has already purchased a ticket will be receiving a prompt refund. Thank you for your support of Resurgence and the ministries of Mars Hill Church. So it kind of looks like Mars Hill beat budget again for the last fiscal year but there were still layoffs and it looks like both the Jesus Festival and the Resurgence 2014 conference got cancelled. Mars Hill Schools would be the collaborative project to commit to amongst the expansion work being pursued and since Corban and Western Seminary already have the infrastructural and administrative cultures that don't need to be made from scratch this would be the project least apt to be negatively effected by either shifting donation levels or unanticipated changes in membership on the Board of Advisors and Accountability. Now of course the sermons that are about to be quoted have been gutted from the Mars Hill media library since earlier this year. All the more reason to share what was previously available to be listened to and read by millions. And the last one, not a lover of money. I love what money can do. I love the fact that we can pay the bills and have heat and light and chairs and sound. I love what money can do but the problem is when you love money. When you love money. When you’re greedy. Addicted to money. Pursuing money. All your thinking about is the money. And isn’t that weird? Because in most jobs, you get promoted for that. They tell you, “Work over time. Work ten times the hours. Work more, more.” Why? Because you could get more money. Well, it’s gonna cost me my family and I’ll never see my kids. Well, that’s okay, you’re gonna make more money. And the pastor it’s like, wait a minute, there’s something more important than money. People. Money is what we use to help people but the people are the most important thing, not the money. Not the money. The money’s the means to the ends. There was a really well-known, prominent, national leader who just got into big trouble because he was spending a lot of the ministry’s money and it was for personal use. Got a new car, hard wood floors in his home, new wardrobe for his wife. Kept billing it to the church, or to the ministry account. You go, “What the?” You know, your tithes shouldn’t be used for personal things. I get a salary for that. But if I feel like this is my church and this is my money, then you put this money in the pot then I just get what I need, I start treating your money like petty cash. Here’s how it works at this church. We are in elder-lead church, an elder-governed church. I’m one vote on the board. I – I can get fired. I can get censored. I can get disciplined. I mean, I’m one of seven guys who vote. First of all, if you want to be an elder in this church, you need to become a member of the church. That means you’re a Christian who has been baptized, gone through a basic theological training. That you’re giving, that you’re serving, that you’re mature, that you’re doing a good job with your family and your ministry and you’re rising up. Quite frankly, in the future, most of our leaders are going to come from our community groups. They’re gonna do a good job taking care of people and they’ll be able to take more people. Pastor [Tim] Beltz: That’s a tough act to follow. Thank you. Just a couple of real quick points. We take this really seriously, the financial controls of the church. Our generosity as a – I’m a members of Mars Hill Church, obviously, and so it’s our generosity that really gives us an opportunity to be great stewards here at Mars Hill Church. It also means that we periodically, quarterly and annually, we talk to outside professionals, independent of our church, and we show them our financial records so that they can provide oversight, and that provides accountability for me and the financial team. The second, on salary determinations. We have – we had about a hundred staff. We’ve had to lay off some folks at Ballard, and there may be some more. But from a salary standpoint, about 18 months ago we came up with a very comprehensive and integrated system for compensation and for performance management. Our performance counts as staff members, and we use a lot of extensive research – national and local data – to be able to identify what’s the right salary for a particular job. We have an audit committee of the board of directors. And this audit committee does a couple things, but primarily they’re the ones who take that research data and they build the compensation tables for our staff. It’s pretty complicated, and I won’t go into it. It’s more detail than you’re probably interested, but it’s something that other churches are really interested in getting from us. But that’s approved annually. And then the salaries of the executive elders are something that’s recommended and approved by the audit committee of the board, so that we can provide, again, that extra objectivity. The chairman of the audit committee is an unpaid elder – not a staff member here at Mars Hill Church. And again, that helps provide some oversight and objectivity to the process. The third point, the annual external audit. We contract with an independent external auditor. And each year, we have our financial records – it’s about a four-month-long process, but they audit our books. And I have to tell ya, we just finished it, and again, we got a sterling report. It’s like bringing home an A year after year after year. And it’s a pretty hard, extensive process. The annual report. We really like to be, and we are, open and want to shed light on everything that we do. And part of that is our philosophy. We have an open books policy to our members. If any of our members want to see financial details, it’s there for them. So for that person who asked Roraback why his questions mattered enough to get answers, there's a pretty simple reason. Roraback had been at Mars Hill so long he could have (whether he technically actually did this or not) cited the public statements of executive leadership at Mars Hill from 2004 and 2008 as establishing a precedent that members could ask to see any of the financials of Mars Hill. giving to is actually stewarding the resources well. That’s fair, right? I mean, some of you would have questions. You’re like, “Well, what do you guys do with the money? You know, do the kids count it? Like, where’s the accounting department? What do we—you know, what do we do?” That’s a fair question, and Paul brings it up, and here’s what he has to say. He says Jesus cares about stewardship. “For we aim at what is honorable not only in the Lord’s sight but also in the sight of man.” So, when it comes to a church or a ministry, receiving tithes, offerings, gifts from God’s people, it’s really important that, number one, the way that the resources are stewarded is pleasing in the Lord Jesus’ sight, that Jesus would look and say, “That’s okay. That’s pretty good right there. You know, I’m encouraged by that,” and in the sight of man, meaning you obey the law, right? There’s nothing worse than a pastor doing prison ministry from the inside because of tax evasion, right? There’s nothing worse than that. And so it’s not just—it has to be that Jesus says that things are taken care of well and that the government agrees. That the government agrees. So, here’s what I’m going to do at this point. I’m going to talk a little bit about how we steward our resources, and this is important. On more that eight hundred occasions, the Bible talks about wealth, finances, possessions, tithing, and stewardship. Twenty-five percent of Jesus’ parables or more are about stewardship, what somebody did with something that they received. So, it’s super, super important. And I’ll answer some of the general questions that come up. First of all, people ask, “Well, who oversees the finances at the church?” Well, there is a finance team of elders and deacons. It’s a team of eight. Their tasks are broken down into income, expenses, purchasing, and then financial reporting. Overseeing that team is Pastor Sutton Turner, your executive pastor. He felt called of God to take a significant pay decrease. He was actually working for a royal family, now he’s just working for the King of kings. He has decided to take a significant discount in his income to come and serve at Mars Hill Church, and so he has built the finance team. Now, working with him, under him is your CFO, Kerry Dodd, B.A. in business with an emphasis in accounting from the University of Washington, ten years working for Deloitte and Touche, a very well-known national accounting firm, three years experience as the CFO of another large church. He and his wife moved back to the area. She is, in fact, from the Puget Sound area. The other members on this team, the six of them, they all have degrees in business, at least a B.A., and in addition, they all have experience in human resources, or accounting, or whatever their specialization might be in the workforce for large, successful, for-profit companies. Okay, so that’s the essence of the finance team. You know, none of us pastors can sign a check, none of us are present when the offering is counted, none of that. Well, first of all, it’s collected, and it’s collected by teams of people that we do a background check on because we don’t want, you know, criminals collecting our offering. And they’ll take the offering and count it immediately, and it’s always a team, and that team is never a couple, like Bonnie and Clyde. Okay? So, we never let a couple count the offering. And then we take the offering, and it is, in fact, deposited. And then some of you will ask, “Well, how do we know that the money is well spent?” Well, first of all, we don’t hand out a lot of credit cards. I mean, you can imagine in your family if you gave credit cards to all the kids and said, “I trust you. It you feel like you need it, go for it.” You’d be like, “That’s a lot of Xbox and they’re swimming in Mountain Dew.” You know? So, we don’t hand out a lot of credit cards, and for any purchase, I think it requires two levels of approval. So, someone can’t just go buy something. They need oversight and supervision so that it can be cleared. Also, the way it works is we have a purchasing department. So, with fourteen churches and growing, not only do we want to ensure that we’re only spending the money that is necessary, but that we’re getting the best deal. How many of you are like my wife and if you can get a deal, that’s a happy day? Full price? You’re like, “No.” It becomes a personal mission, like, “I’m going to find the best price.” I married that girl, okay? There’s a whole bunch of reasons I love her. That’s one. She’s always looking for a deal. The church needs to behave just like your personal budget. If we need something, then the requisition is made, and if it’s approved by the finance department, they will go shopping for the best deal, lowest price, because the church should conduct itself like you do, get the best deal. And so you know as well, as soon as our bill comes in, we have a practice of immediately paying our vendors, because there’s nothing worse than, “Yeah, I sold something to Mars Hill and they didn’t pay me, and they quoted a verse about not suing, but I think they’re very suspicious people, those Mars Hill people.” So, if we do business with you, our goal is as soon as you send the invoice, we send the check because we want to have a good reputation with our vendors and with those that we purchase from. Then the question often gets asked, “Well, what about salaries?” I’ll say a couple of things on this. Just like your profession if you’re in the workforce, there are national job descriptions and then pay ranges and scales for certain levels of responsibility. Everybody gets a job description. We do twice a year annual 360 performance reviews. People are weighted according to their responsibility and duties, and then this national scale is used to set the pay scale. And we tend not to be anywhere near the top. We’re not at the bottom. We’re somewhere in that reasonable middle as a general rule, and the salaries and the salary ranges are not set by the paid employees. So, unpaid leaders in the church and unpaid leaders outside of the church oversee the establishing of the salaries of the employees. So, it’s not like somebody is a pastor at one of the churches and sets their own salary. You could go to jail for that. It’s illegal. So, part of this is not only acceptable in the eyes of God, but also acceptable in the eyes of government. And what this means practically as well, we tend to have a very small staff. If you include, I don’t know, thirty-some services a Sunday, fourteen locations, five residents getting ready to be sent out to plant, plus the Resurgence and everything else we’re doing, the fact that we only have 136 employees is very, very, very small. I was meeting with pastors of somewhat larger churches recently. One had 750 employees, the other had 800, okay? One of the churches owns 500 acres of real estate. We call that Seattle. Like—so, for us, we tend to use very small square footage for the number of people, and we tend to have a very, very, very small staff for the size of our church. In addition, then, we are finalizing our application to the Evangelical Christian Financial Accountability Association. It’s like the Good Housekeeping Seal of Approval to also provide all of our finances for outside oversight. And in addition to that, we have an external board of leaders, godly people, some of them pastors in other churches, that also have access to our finances and all of our reporting, just to make sure that we have internal and external, we have Christian and non-Christian oversight and accountability. And we also have contracts with the banks for certain real estate that we own, and the banks give us additional requirements, like you have to keep this much in cash reserve, you have to keep your finances at this kind of level so that we don’t default on any of our loans. I think it’s fair to ask those kind of questions. I really do. I really do, and so I’m glad to answer them. But that’s what he says. It’s a generous gift, it’s a grace, and it needs to be stewarded well. That is a very lengthy excerpt and there's something that didn't get mentioned in 2012 that got mentioned by Mark Driscoll in 2004 and Tim Beltz in 2008 and that would be the open book policy where any member could simply ask where all the money actually went. Specifically, Tripp wrote, "But it became clear to me that a distant, external accountability board can never work well because it isn't a firsthand witness to the ongoing life and ministry of the church." Mark Driscoll could roll out an explanation of all the internal and external accountability structures until he's blue in the face, it's not a substitute for opening up the books to any member who asks what Mark Driscoll's annual salary actually is. If Mark Driscoll said ten years ago that there were open books to any members with questions and Tim Beltz repeated the sentiment in 2008 then if Driscoll didn't explicitly repudiate that sentiment from the pulpit in 2012 why would Dalton Roraback have gotten the response he reports he got in 2014? A week ago, I posted an anonymous statement from a former staff member in the central office at Mars Hill Church. Today, I can offer you another statement from the same staffer. I received this quote from Rachel Macor, a former staffer in Mars Hill finance department. Here is her quote. I believe that Mars Hill leadership knew from the start that donations to the Global Fund were restricted and could not be used for unrestricted purposes. In fact, there was a separate account for Global in the books to note this distinction. During my time in the Finance Department, there was a pointed emphasis to be sure that restricted funds were not co-mingled with general funds. I believe that among the Financial Leadership Team (which includes multiple CPA-level staff, who would know all the ins and outs of restricted and unrestricted donations), there was a clear awareness that any restricted funds could not be directed to the general fund. Without a doubt in my mind, Mars Hill leadership knew what they were doing. Throckmorton continues to note that ECFA president Dan Busby wrote a document clarifying donations and designations and that "Busby makes it clear that donors signal donor intent, not the organization who received the donation." Organizations that receive donations have to designate donations based on what the donor's restriction might specify rather than the aims (stated or otherwise) of the entity doing the fundraising. For those who may not know what Macor's role was, a composite screen capture of a 2011 event may be helpful. Aspen, Rachel Macor could help you w/this, she’s the income bookkeeper and processes the credit card payments. MHC does take AmEx and she should be able to troubleshoot for you. So back then Driscoll made it clear that marshillglobal was an iniative led by Jamie Munson with the aim of soliciting online listeners and supporters to donate to expansion projects. To the extent that Throckmorton has been blogging about Mars Hill Global with questions about where the money was going and how the money was being solicited the fuzziness seems to have set in regarding Mars Hill Global not so much during the tenure of Munson (as Wenatchee The Hatchet currently understands it) as when Sutton Turner arrived and a massive overhaul in staff and employees took place between 2011 and 2012. Throckmorton, in the close of his piece reiterates that the donor rather than the solicitor is the one to determine the designation and purpose of a gift and that Mars Hill policy seems to have been backwards on this set of responsibilities. After some silence regarding the resignation, Paul Tripp has explained why he resigned from the Mars Hill Board of Advisors and Accountability. So, since I knew that I could not be the kind of help that I would like to be through the vehicle of the BoAA, I resigned from that position. I would still love to see the leadership community of Mars Hill Church become itself a culture of grace and I am still willing to help, but not through the means of a board that will never be able to do what it was designed to do. For Throckmorton's back to back presentation of Tripp's explanation for his resignation and Michael Van Skaik/Larry Osborne's explanation you can visit the link below. Now the consultation explanation provided previously by members of the BoAA could still be happening but perhaps Tripp can address that at some point down the road as well. 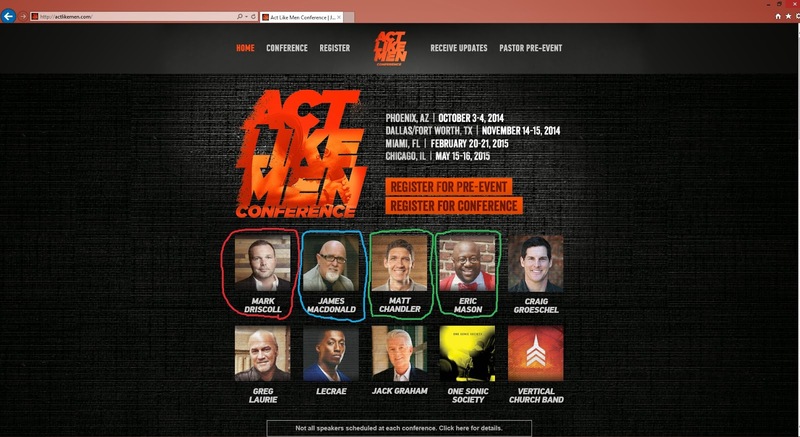 Observe, then, that Mark Driscoll, James MacDonald, Matt Chandler and Eric Mason are scheduled speakers at the upcoming Act Like Men conference. Some might say that in light of this weekend's announcements and counter-announcements that the boys could be doing a better job of acting like men. Driscoll is set off with red, MacDonald with blue, and the boys from Acts 29's board in green. As Wenatchee The Hatchet has been noting, whatever changes in literary and verbal style may have taken place in the tone of Mark Driscoll's interaction with the subjects of gender and sexuality it may be useful to ask whether the substance of his message has not remained fundamentally unchanged. "Act Like Men" is certainly more restrained, dignified and marketable than "Pussified Nation". There's plenty of time between now and the Act Like Men conference for the relevant parties involved to explain what's been going on lately. For instance, how long ago did leadership at Acts 29 know about Mark Driscoll's writings as William Wallace II? Did it in any way impact the thoughts leadership had about Driscoll? How far back would Acts 29 be willing to say it knew of issues with Mark Driscoll it considered problematic? Since this statement on the part of Acts 29 leadership is relatively new why were no comparable statements made, say, in 2005? 2007? 2009? The board in its current form didn't start coming about until about the spring of 2012.